Since 1949, the town of Mochitlán, Guerrero, has enjoyed the craftsmanship of maestro mezcalero whose knowledge has been passed down as a family heirloom. Mayalen´s production is focused on the use of wild agave variations. Every part of our production is supervised by their expert maestro mezcalero. 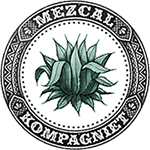 At Mezcal Mayalen, we respect the uniqueness of each lot and its original essence. Our product is 100% hand-crafted and organic. The finesse and elegance of Mayalen’s superior quality is sure to satisfy any connoisseur. The harvest takes place onsite and the pieces are transported down the mountaintops in a caravan fashion where they are cooked in an earthen oven, crushed and then distilled in a copper bell, alambique. This mezcal is potent with elegant herbal and citric notes and a spicy kick.